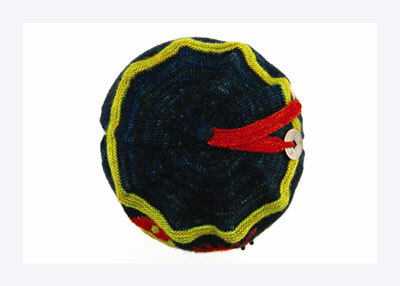 This lovely intarsia-knit tea cozy is inspired by the black tea enjoyed in China. Wulong’s open sides and hat-shaped top accommodate a wide variety of teapots. 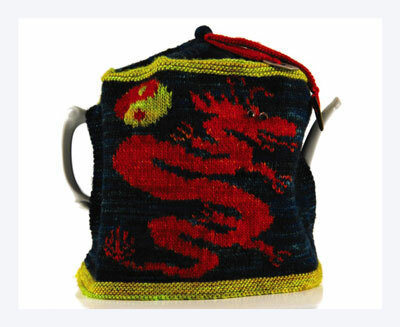 The deeply saturated colors of this hand-dyed yarn perfectly accentuate every detail of the intarsia dragon. 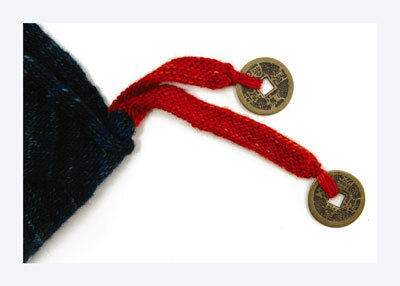 Found objects like Chinese coins and sparkling beads emphasize Wulong’s exotic look. Foll chart, with CC1, CO 101 sts using long-tail CO. Work back and forth in garter st for 8 rows. Change to MC and work in St st for 2 rows, as shown on chart. Beg with Row 11 of chart, work intarsia patt. When 84 rows of chart are complete, break yarn and place live sts on holder. Weave in ends on WS and steam lightly to block. Sew beads through sequins as shown for eyes. Change to MC and work in St st for 30 rows, as shown on chart. Beg with Row 39 of chart, work intarsia patt. Weave in ends on WS and steam lightly to block. 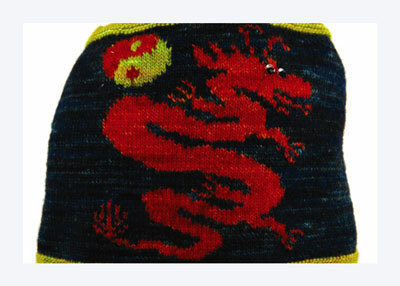 When working only one or two stitches of a contrasting motif (such as the dragon’s claws), it may be easier to strand the yarn across the wrong side of the work than to introduce a different yarn supply. Foll chart and beg with a RS row, change to CC1 and work in garter st across all sts. Without breaking yarn, continue knitting across all sts of front. Join for working in rnds and cont working in garter st for 7 more rnds. To work garter stitch in the round, you must alternate knit and purl rounds. Change to MC and knit 1 rnd, dec 1 st at beg of rnd and another after 100 sts — 200 sts. Dec rnd 1: *K18, k2tog, PM; rep from * around — 190 sts. Next and every foll alternate rnd: Knit. Dec rnd 2: *Knit to 2 sts before M, k2tog; rep from * around — 10 sts dec’d. 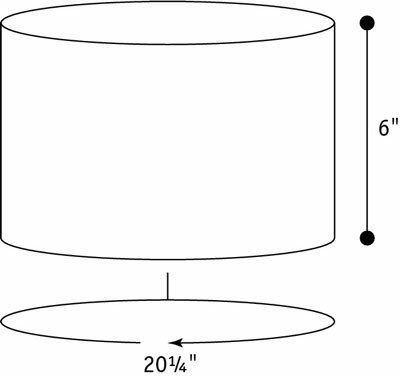 Rep dec rnd 2 every other rnd 16 more times — 20 sts. Next rnd: [K2tog] 10 times — 10 sts. Knit 1 rnd. [K2tog] 5 times — 5 sts. Break working yarn and thread through tapestry needle. Thread needle through last 5 sts and pull snugly to close. Fasten securely on WS, weaving in end. Ribbon: With CC2, CO 60 sts using long-tail CO. Work back and forth in garter st for 8 rows. BO and weave in ends. Sew coins to ends of ribbon through center holes, as shown, weaving in ends. Top bobble: With MC, CO 6 sts, leaving 18″ yarn tail at beg of CO. Work back and forth in St st for 8 rows. Break yarn, leaving 12″ tail. Thread tail through tapestry needle. 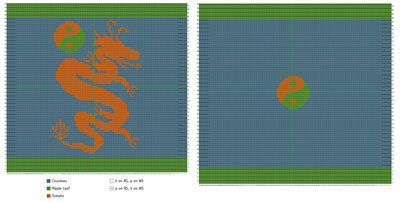 Run needle through live sts, then sew running sts around rem 3 sides of piece. Wind yarn tail from CO into a ball small enough to fit inside piece (wrap around one finger). Place yarn tail ball on WS of piece. Pull working end with tapestry needle to snug bobble around filling. Fasten securely to underside of bobble. Do not break yarn yet. Fold ribbon decoration unevenly. Using tapestry needle still attached to top bobble, stitch bobble to top of tea cozy through folded ribbon. Fasten securely on WS, weaving in ends. Place cozy on teapot to determine optimal placement for side openings. Tack front and back sides of cozy tog with MC under teapot spout and handle, as shown. Weave in yarn tails from tacking sts on WS.